Finally, the day has come for me to share all these exciting changes with you and I couldn't be happier to share all these pictures! You got a sneak peak with my 2014 album title page here, and I asked if any of you could guess what my new changes are. Before I share them with you though, I want to quickly go over the things that will remain the same. -I'm documenting life in chronological order, outlined by month. I do not do it by each week or day. I think title pages for each week would be a waste of space in my album. 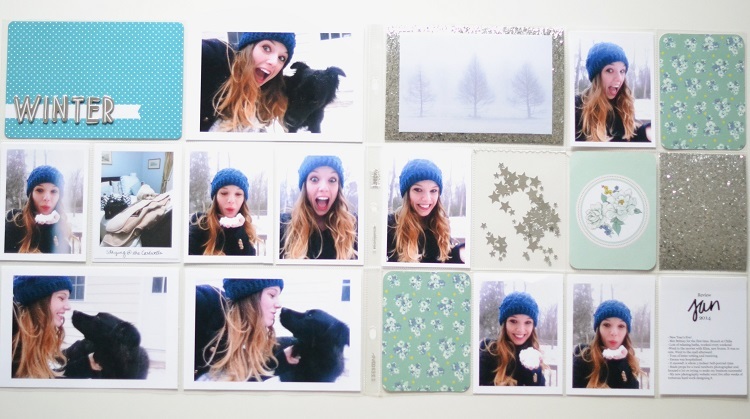 I also love the freedom that this gives me because I can mix around my photos within each month to get the best look. Sometimes you'll end up with a picture that just doesn't go with the others from that week. I had a lot of pastels this month that didn't mix well with the crisp, clear and bright pictures I usually have. It was easy for me to group those together on their own page this month instead of trying to disperse them according to their proper week. This also means that some days or weeks I won't have any pictures, then other times I'll have a whole spread for one day or occasion. For me, this works best! 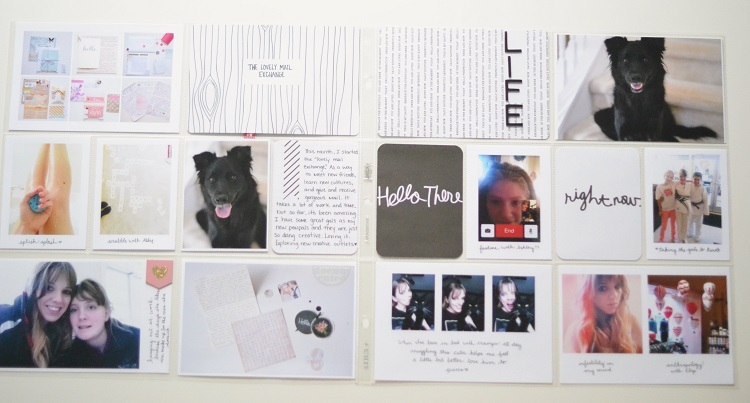 -I'm still going to be using a mix of different Project Life core kits, other brands such as MAMBI pocket pages, online freebies and of course cards that I make myself. -I'm still going to embellish some of my layouts with gorgeous sequins or other elements and then sewing that pocket shut. You'll get to see one of the gorgeous ways I did that in the new album in this post! And I'm still relying on needle and thread because I don't know how to sew and don't need to waste the money on a machine. 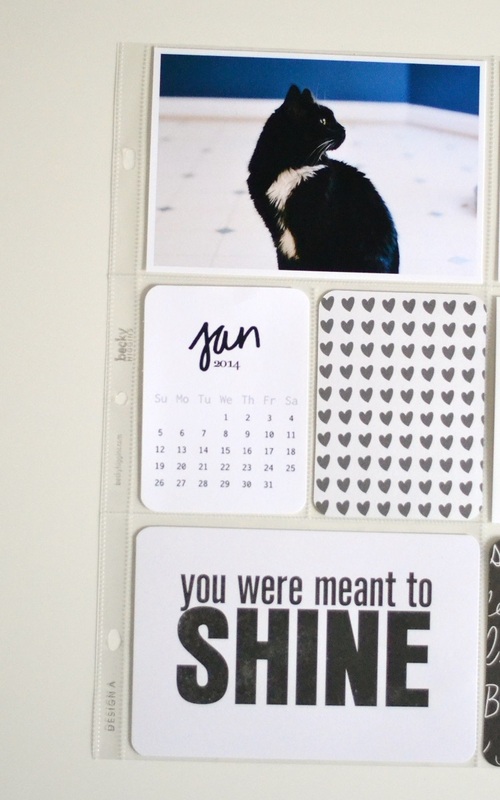 -Monthly calendar cards to signify when a new month in my album has started. I actually love how gorgeous these look without wasting an entire 4x6 pocket as a monthly title card. 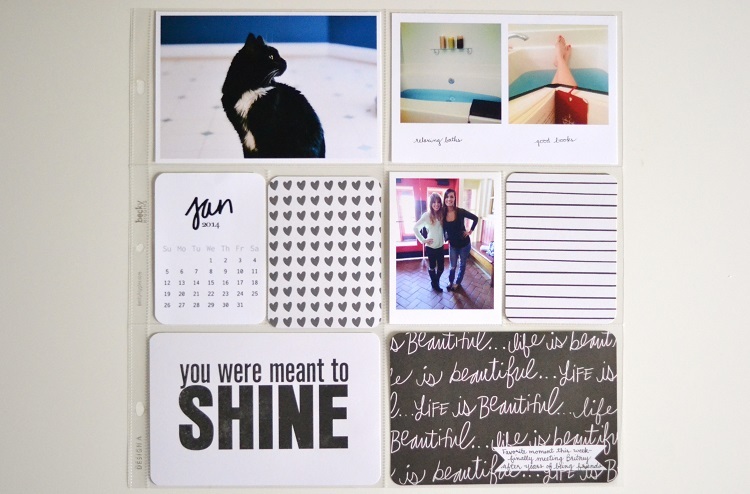 I created my gorgeous 3x4 monthly calendar cards using online freebies! I used this calendar from Ruby Bows. In paint, I deleted the dotted border and the month text. Then I added in this gorgeous hand-written month script from Caylee Grey, also a freebie. 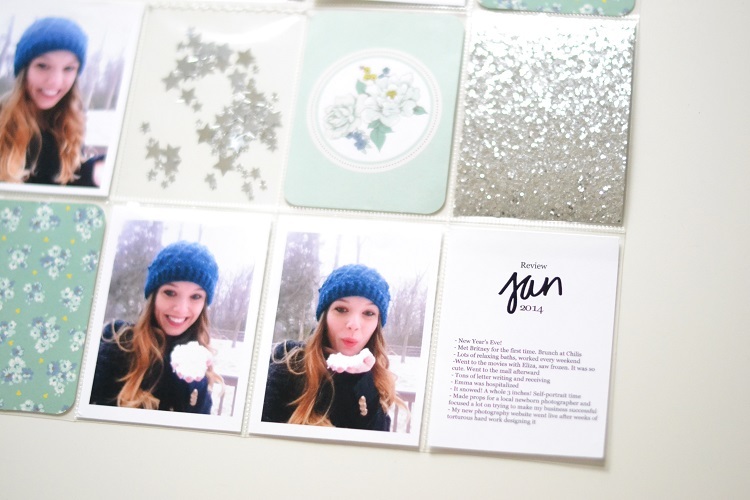 -More white space in my albums. I want to give my pictures some room to breathe. Besides adding a white border to all of my pictures, I'll also be relying heavily on the Midnight Edition core kit to bring in more white to my layouts. I'm pairing these with bright colors from the Sunshine Edition and Jade Edition. I'm currently loving all the bright, crisp core kits and shying away from all the pastels that I gravitated towards last summer. -Better pictures. This year, one of my goals is to take better pictures of my everyday life and moments and to take more self-portraits. Off to a good start! 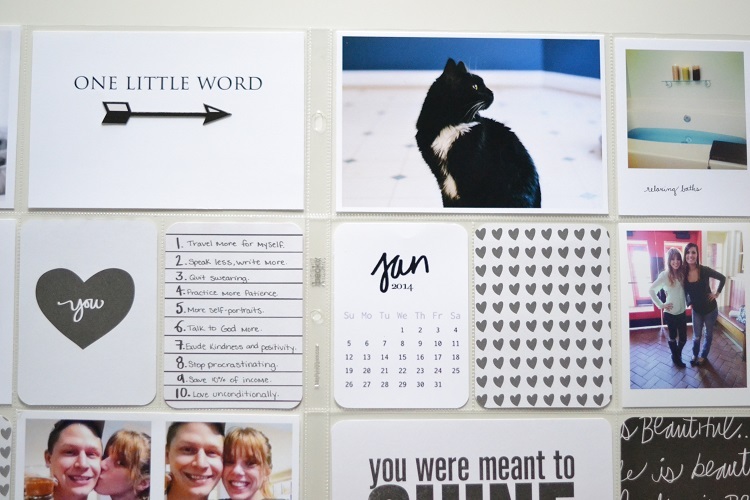 -This year, I'm making my Project Life album about me. It's about my life, my moments and my memories. Last year, I got so caught up in documenting our life together and other people's moments, that the little every day moments of MY life got swept under the rug. But I'm single! (In the terms of not being married.) And my album should be documenting my life. While my boyfriend is a huge part of that, he's not the only part and I'll be documenting a lot more of my own life/goals/memories intentionally this year. It's important for me that I remember that my life is worth documenting- even the moments don't center around my relationships or family togetherness. Maybe even especially those moments that are all about me and my goals and friendships and life. 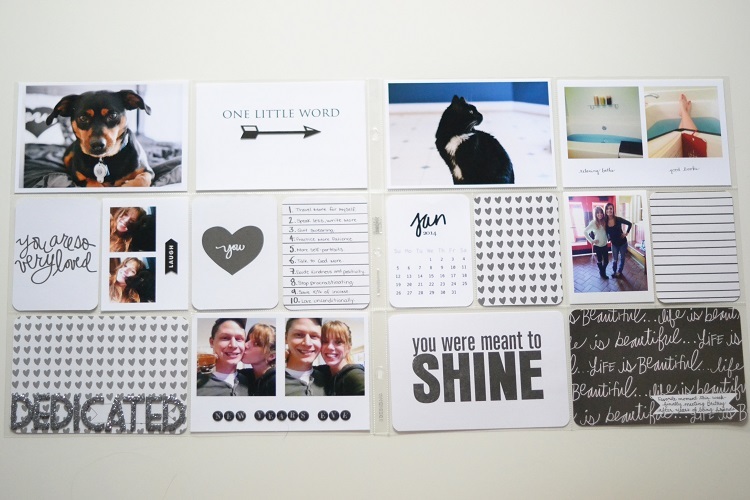 Because I'll have all the time in the world to document our life together/our family when we are married. Right now I'm going to take this time to document my life as a girl whose working hard, creating beautiful things, snuggling her pets and loving her boyfriend. Firstly, that photo of your cat looks SO MUCH like my old cat. Beautiful. Now that that's out of the way, we can concentrate on how gorgeous your pages are looking. Love love love how much glitter you're using. I especially love how you used my Jan word art. Your pages are more and more beautiful every time you share. I love your changes, and I especially agree with you about making PL about YOU. It's easy to lose focus of ourselves but it's so important that we pay attention to our hearts. Oh, cats are just so beautiful. I wish they weren't so moody, but I put up with him because he's worth all the trouble. He's getting old though- I've had him for 10 years! Thank you sooooo much Caylee <3 I'm glad you love the way I used it, thanks so much for offering that freebie because I adore the scripted font and it would have been a lot of work to try and recreate that process for myself! I'm absolutely thrilled to hear you say that I keep getting better- one of my goals this year is to apply to different creative teams and make it onto at least one! So hopefully I'm off to building a good portfolio so someone fabulous will have me. AND YES! Let it be about us girls <3 It is OUR scrapbook after all. Should be about us, we're putting all the hard work into it :) Last year I got so focused on documenting he and I together, and then his moments with his family, now I look through my album and never see any pictures of myself or any of my goals or memories- they are all ours or his. I'm really looking forward to changing that this year. I super love what you say "It's so important that we pay attention to our hearts." 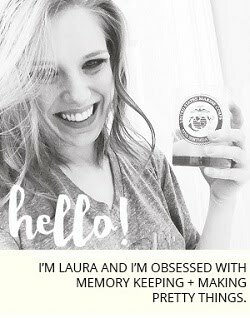 I recently stumbled across your blog and I just have to say I LOVE your scrapbook style. So inspiring! I so wish I was as creative as you!!! !